A Trigger Point (TrP) is a hyperirritable spot, a palpable nodule in the taut bands of the skeletal muscles' fascia. Direct compression or muscle contraction can elicit jump sign, local tenderness, local twitch response and referred pain which usually responds with a pain pattern distant from the spot. Jump sign is the characteristic behavioral response to pressure on a TrP. Individuals are frequently startled by the intense pain. They wince or cry out with a response seemingly out of proportion to the amount of pressure exerted by the examining fingers. They move involuntarily, jerking the shoulder, head, or some other part of the body not being palpated. A jump sign thus reflects the extreme tenderness of a TrP. This sign has been considered pathognomonic for the presence of TrPs. Local twitch response - defined as a transient visible or palpable contraction of the muscle and skin as the tense muscle fibers contract when pressure is applied. Coursed by needle penetration or by transverse snapping palpation. Referred pain, also called reflective pain, is pain perceived at a location other than the site of the painful stimulus. Pain is reproducible and does not follow dermatomes, myotomes, or nerve roots. There is no specific joint swelling or neurological deficits. Pain from a myofascial TrP is a distinct, discrete and constant pattern or map of pain with no gender or racial differences able to reproduce symptoms - referred pain map. (Radiating pain is slightly different from referred pain; for example, the pain related to a myocardial infarction could either be referred or radiating pain from the chest. Referred pain is when the pain is located away from or adjacent to the organ involved; for instance, when a person has pain only in their jaw or left arm, but not in the chest). Trigger points develop in the myofascia, mainly in the center of a muscle belly where the motor endplate enters (primary or central TrPs). Those are palpable nodules within the tight muscle at the size of 2-10 mm and can demonstrate at different places in any skeletal muscles of the body. We all have TrPs in the body. Can be present even in babies and children, but their presence does not necessarily result in the formation of pain syndrome. When it happens, TrPs are directly associated with myofascial pain syndrome*, somatic dysfunction, psychological disturbance and restricted daily functioning. *Myofascial Pain Syndrome refers to regional pain of soft tissue origin and is associated with muscle tenderness that arises from TrPs, focal points of tenderness, a few millimeters in diameter, found at multiple sites in a muscle and the fascia of muscle tissue. Injury sustained by a fall, by stress or birth trauma. Primary or Central TrPs are those that cause severe pain locally at the pressure with irradiation according to referred pain map. Usually are based around the center of a muscle belly. Secondary or Satellite TrPs arise in response to existing central trigger points in surrounding muscles. They usually spontaneously withdraw when the central TrP is healed. Can be present in the form of a cluster. Active TrP is any point that causes tenderness and referral pain pattern on palpation. Almost always central TrPs are active and some satellite TrPs are also active (but not necessarily all of them). Inactive TrPs can eventually become active if there is a provocative factor. Inactive or Latent TrPs can develop in anywhere and under fingertips feel like lumps, but are not painful. Can increase a stiffness of the muscles. Commonly happen in case of severe postural deformity where initially primary TrPs are multiple, so secondary multiple TrPs are only a response of a mechanism, called diffuse. Arise in tendo-osseous junctions which become very tender. If not treated, degenerative processes of an adjacent joint can spring up. Even ligaments can develop trigger points. Presence of TrPs in the anterior longitudinal ligament of the spine can result in neck instability. Some knee pain syndromes are successfully healed when treated ligamentum patellae and fibular collateral ligament. Little is known about the formation of TrPs. There are some theories written in literature who try to explain the formation, sensitization, and manifestation of TrPs, but few of them have strong evidence. Under normal conditions, pain from TrPs is mediated by thin myelinated (Ad) fibers and unmyelinated (C) fibers. Various noxious and innocuous events, such as mechanical stimuli or chemical mediators, may excite and sensitize Ad fibers and C fibers and thereby play a role in the development of TrPs. Integrated Trigger Point Hypothesis (ITPH) is the present working hypothesis. When sarcomeres and motor endplate become overactive for a number of different reasons, pathological changes start at cellular levels. This turns on permanently sarcomeres leading to a local inflammatory response, loss of oxygen supply, loss of nutrient supply, endogenous (involuntary) shortening of muscle fibers, and increased metabolic demand on local tissues. Electrophysiological investigations of TrPs reveals phenomena which indicate that the electrical activity arises from dysfunctional extrafusal motor endplates rather than from muscle spindles. Polymodal theory explains the existence of polymodal receptors (PMRs) throughout the body which under certain constant, pathological stimuli turn into trigger points. Radiculopathic theory explains direct relationship between problems on nerve roots which lead to local and distant neurovascular signals and trigger points creation. Peripheral and Central Sensitization - Central sensitization is a phenomenon, together with peripheral sensitization, which helps in understanding chronic or amplified pain. There is central sensitization after an intense or repetitive stimulus of the nociceptor present in the periphery, leading to a reversible increase of excitability and of the synaptic efficacy of central nociceptive pathway neurons. Manifested as hypersensitivity to pain (called tactile allodynia and hyperalgesia secondary to puncture or pressure). These CNS changes may be detected by electrophysiological or imaging techniques. Fibromyalgia - characterized by diffused fatigue and aches all over the body. More often in women, does not involve joints but does involve all other tissues (muscle, bone, tendon, ligaments, and fat) and can develop tender points. Tender points are discrete areas of tenderness over soft tissues that cause local pain and are tender to palpation but patients do not present jump signs when pressed nor referred pain maps. These two pain syndromes may overlap in symptoms and are difficult to differentiate without a thorough exam by a skilled physician. Although they may be concomitant and may interact with one another. A patient usually asks for help due to a chronic pain state (ex: headaches, aches everywhere, morning stiffness, TMJ syndrome, tinnitus...), which, in reality, is often physically away from the active trigger point. Muscle weakness or imbalance, altered motor recruitment, in either the affected muscle or in functionally related muscles. Changes in Range of Motion (ROM). Painful movement and/or movement that sometimes can exacerbate symptoms. Tension headaches, migraines, tinnitus, temporomandibular joint problems... as accompanying symptoms. No laboratory test or imaging technique has been established for diagnosing TrPs. Anamnesis (a patient's account of their own clinical history) should be specific. The patient must be asked about fibromyalgia, as well as the presence of it in the family history of diseases. Also, the patient should be asked about his physical and daily activities in the presence and in the past as a lack of exercise and sedentary life may be a pathogenic factor. Furthermore, (chronic) muscle overuse, daily stress, medications (and its overuse), sleep disturbances have to be asked and examined in details. The initial onset of pain and the recurrence of pain are of muscular origin. Reproducible spot tenderness occurs in the muscle at the site of the trigger point pain. Pain is referred locally or at a distance on mechanical stimulation of the trigger point. This referred pain and tenderness projects in a pattern characteristic of that muscle and reproduce part of the patient’s complaint. A local twitch response of the taut muscle and jump sign occur when the trigger point is stimulated. Examination through palpation can be performed standing, sitting or lying down. There also have to be performed the ROM examination as well as postural examination. Fischer has proposed the use of a pressure threshold meter (algometer), as a means of quantitative documentation of TrPs, and for quantifying the effects of the physical therapy treatment. Pressure pain threshold and visual analogue scale (VAS) scores were the outcome measures more used in the analyzed trials. ROM also may be an outcome measurement for evaluating therapy. Medications - Milder forms of pain may be relieved by over-the-counter medications such as Tylenol (acetaminophen) or nonsteroidal anti-inflammatory drugs (NSAIDs) such as aspirin, ibuprofen, and naproxen. Both acetaminophen and NSAIDs relieve pain caused by muscle aches and stiffness, and additionally, NSAIDs reduce inflammation (swelling and irritation). If over-the-counter drugs do not provide relief, a doctor may prescribe muscle relaxants, anti-anxiety drugs (Valium), antidepressants (Cymbalta), NSAIDs such as Celebrex, or a short course of stronger painkillers (codeine), hydrocodone and acetaminophen (Vicodin). Trigger Point Injection (TPI) is a procedure of inserting a small needle into the patient's active TrP. The injection contains a local anesthetic or saline and may include a corticosteroid. With the injection, the TrP is made inactive and the pain is alleviated. Often, a brief course of treatment will result in sustained relief. Injections are performed by a physician and usually take a few minutes. Several sites may be injected in one visit. If a patient has an allergy to a certain drug, a dry-needle technique (involving no medications) can be used. Ischemic Compression Technique - the term has been used to describe treatment in which ischemia is induced in the TrPt zone by applying sustained pressure. However, this principle is questionable, since the nucleus of the TrP intrinsically presents important hypoxia. Simons described a similar treatment modality, though without the need to induce additional ischemia in the TrP zone (TrP Pressure Release). The aim of this technique is to free the contracted sarcomeres within the TrP. The amount of pressure applied should suffice to produce gradual relaxation of the tension within the TrP zone, without causing pain. Yet both techniques show imitate significant improvement of the ROM after treatment. Prolotherapy (injecting solutions in the region of TrPs: lidocaine, glycerine, phenol...). ↑ 1.0 1.1 Simons DG, Travell JG, Simons LS. Travell & Simons' myofascial pain and dysfunction: upper half of body. Lippincott Williams & Wilkins; 1999. ↑ 2.0 2.1 2.2 Alvarez DJ, Rockwell PG. Trigger points: diagnosis and management. American family physician. 2002 Feb 15;65(4):653-62. ↑ 3.0 3.1 Davidoff RA. 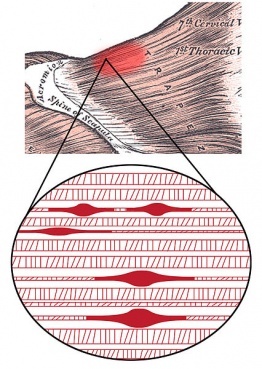 Trigger points and myofascial pain: toward understanding how they affect headaches. Cephalalgia. 1998 Sep 1;18(7):436-48. ↑ Eduardo Vázquez Delgad, et al. Myofascial pain syndrome associated with trigger points: A literature review. (I): Epidemiology, clinical treatment and etiopathogeny Med Oral Patol Oral Cir Bucal. 2009 Oct 1;14 (10):494-498. ↑ 5.0 5.1 5.2 Niel-Asher S. The concise book of trigger points: a professional and self-help manual. North Atlantic Books; 2014. ↑ Ray BS, Wolff HG. Experimental studies on headache: pain-sensitive structures of the head and their significance in headache. Archives of Surgery. 1940 Oct 1;41(4):813-56. ↑ Simons DG, Travell JG, Simons LS. Travell & Simons' myofascial pain and dysfunction: upper half of body. Lippincott Williams & Wilkins; 1999. ↑ Jantos MA. Understanding chronic pelvic pain. Pelviperineology. 2007;26(2):66-9. ↑ 9.0 9.1 9.2 Vázquez Delgado E, Cascos-Romero J, Gay Escoda C. Myofascial pain associated to trigger points: a literature review. Part 2: differential diagnosis and treatment. Medicina Oral, Patología Oral y Cirugia Bucal, 2010, vol. 15, num. 4, p. 639-643. 2010 Jul 1. ↑ Delgado EV, Romero JC, Escoda CG. Myofascial pain syndrome associated with trigger points: A literature review. (I): Epidemiology, clinical treatment and etiopathogeny. Medicina oral, patología oral y cirugía bucal. Ed. inglesa. 2009;14(10):1. ↑ Tough EA, White AR, Cummings TM, Richards SH, Campbell JL. Acupuncture and dry needling in the management of myofascial trigger point pain: a systematic review and meta‐analysis of randomised controlled trials. European Journal of Pain. 2009 Jan 1;13(1):3-10. ↑ Simons DG. Clinical and etiological update of myofascial pain from trigger points. Journal of musculoskeletal pain. 1996 Jan 1;4(1-2):93-122. ↑ Kawakita K, Itoh K, Okada K. The polymodal receptor hypothesis of acupuncture and moxibustion, and its rational explanation of acupuncture points. InInternational Congress Series 2002 Aug 1 (Vol. 1238, pp. 63-68). Elsevier. ↑ Gunn CC, Wall PD. The Gunn approach to the treatment of chronic pain: intramuscular stimulation for myofascial pain of radiculopathic origin. Churchill Livingstone; 1996. ↑ Fernández-de-las-Peñas C, Cuadrado ML, Arendt-Nielsen L, Simons DG, Pareja JA. Myofascial trigger points and sensitization: an updated pain model for tension-type headache. Cephalalgia. 2007 May;27(5):383-93. ↑ Woolf CJ. Central sensitization: implications for the diagnosis and treatment of pain. Pain. 2011 Mar 1;152(3):S2-15. ↑ Simons DG, Dommerholt J. Myofascial trigger points and myofascial pain syndrome: a critical review of recent literature. Journal of Manual & Manipulative Therapy. 2006 Oct 1;14(4):125E-71E. ↑ 18.0 18.1 de las Peñas CF, Campo MS, Carnero JF, Page JC. Manual therapies in myofascial trigger point treatment: A systematic review. Journal of bodywork and movement therapies. 2005 Jan 1;9(1):27-34. ↑ Persons O. Pharmacological management of persistent pain in older persons. J Am Geriatr Soc. 2009;57(8):1331-46. ↑ Simons DG. Myofascial pain syndrome due to trigger points. Ohio; 1983. ↑ Grieve R, Clark J, Pearson E, Bullock S, Boyer C, Jarrett A. The immediate effect of soleus trigger point pressure release on restricted ankle joint dorsiflexion: a pilot randomised controlled trial. Journal of bodywork and movement therapies. 2011 Jan 1;15(1):42-9. ↑ Montañez-Aguilera FJ, Valtueña-Gimeno N, Pecos-Martín D, Arnau-Masanet R, Barrios-Pitarque C, Bosch-Morell F. Changes in a patient with neck pain after application of ischemic compression as a trigger point therapy. Journal of back and musculoskeletal rehabilitation. 2010 Jan 1;23(2):101-4.